It’s been a while since my last post and, straight up – it’s not been a good month. Two significant problems has meant I’ve lost all of my keepers; yes, all of them. That’s all the late summer spawning fry AND all the early summer ones too. Ok, so here’s how it happened. After the late summer harvest I selected around 100 x 1 incher’s to grow on. I was holding them in a floating cage net in my main 10k litre growing on tank which is where my early summer spawnings were, and they are around 4 inches on average. The plan was to set up another tank and split the 1 inchers and 4 inchers between the two tanks but run off the same filtration system. I use a drum filter you see which makes this whole project viable for me, because of the automatic filter cleaning saves me a lot of time – so I’m making best use of that by linking the two tanks up to it. I bought a tank, and just before setting it up came the first of the two problems. The cage net with my 1 inch keepers accumulated a lining of algae and this in itself is ok. But, on a particularly sunny day the algae must have been generating oxygen with such vigour that there were so many little bubbles of gas on the algae that the sides of the cage net floated – literally collapsing the cage net upwards and inwards and – wait for it… - lifting the 1 inch koi clear out of the water! That accounted for most of the 1 inchers. It’s difficult to explain how that felt – those 1 inchers were the result of a series of pricey risks I’d taken on new females, fry pond liners, my time, friends feeding the koi while I was away etc etc, and then the possibilities they promised, the opportunity to see the showa and my new kohaku female genetics play out and so on. Basically extinguished on one sunny afternoon. A costly mistake, and I have now learned to put a few stones in the cage net to weigh it down…. After that happened, and with just a few 1 inch keepers left - it just didn’t seem worth going to all the effort to set another tank up and I focussed on other priorities. So next up was adjusting the filtration on my growing on pond to incorporate an air source heat pump (to heat the water), and change the plumbing and filtration to improve water flow and quality –which wasn’t as good as it needed to be. I got some fab pond plumbing tips from from Syd Mitchell that I learned during his talk at Kangei Koi Club in September – and they all worked a treat. It was very satisfying once it was done and water quality improved quickly. I took the tank up to 23 degrees over a week and about a week later I lost a fish. I couldn’t understand it because a few weeks earlier I’d treated all my ponds for all the common parasites as a preventative measure – and I’d corrected the poor flow in the growing on tank with new plumbing, and added more filtration media to help with water quality. I did more scrapes, and found nothing. A couple of days later, and another one gone. To cut to the chase – turns out costia got through 2 weeks at 0.75% salinity, had regrouped and was enjoying the warmer temperatures causing major problems in the growing on tank. I treated again with even higher salt but with many of the 4 inch keepers lost – and all remaining ones badly affected, I threw in the towel yesterday. Both brood fish tanks seem fine, and I haven’t found any costia there. They are separate systems in their own right, but only a few meters away from the growing on tank so I am treating them again to be on the safe side. I cleaned the growing on tank, treated it with a heavy PP dose and it’s still purple after 24 hours. I’ll leave it a few more days, then move a few adult fish into it to start the filtration cycling through the nitrogen cycle and to check the tank is clear of bugs before I put anything of value back in it. ok, so this is about as exciting as it gets for this blog update. a pond being PP'd. I can’t tell you what a blow this has been. But… as a friend said to me the other day, at least I’ve learned the lesson in year 1 when my harvests have been small. And it’s well learned ahead of year 2 when I hope to do much better. It also serves as a reminder that this is just a hobby for me - the bottom line is that when it goes wrong its frustrating and upsetting but in the end it is nothing more than a hobby. The challenges I've faced serve as a reminder of how difficult it is to produce koi, let along good quality ones, and farming koi for a living must be tough and risky. That's partly what I hope to share with other hobbyists in this blog; the nitty gritty. I hope I've learned enough lessons this year, and with the setup now mostly in place, I expect to make a better go of it next year. So now, all that’s left to do is the big clear up and some additional set up tasks. I’ve got nets to clean, hoses to put away, general tidying up and so on. 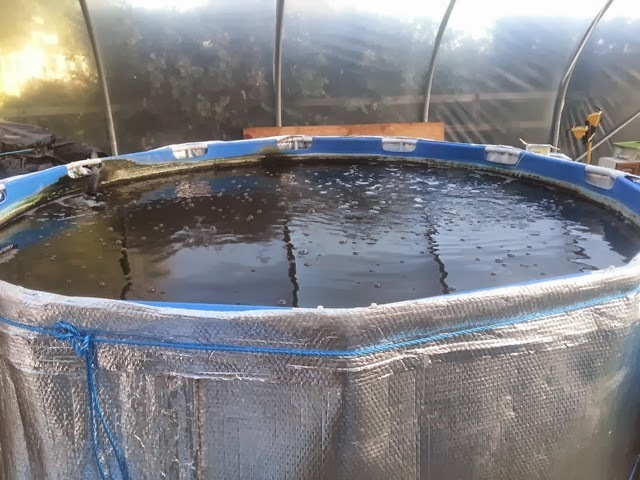 There’s work to do outside on the fry pond banks, and I need to set up another two tanks in the polytunnel – one more 10k litre one, and a smaller growing on tank too. These will be connected to the growing on filtration system – and whilst it’s risky having all the tanks on one system, I need the automatic cleaning from the drum to make the project viable for me to do time wise. Next year, in addition to the two outdoor ponds, I will rear whole spawnings indoors with techniques I’ve learned from Allan Bennet – a hobbyist living in Australia who has produced some stunning koi with this method. Bear in mind they’ve had no koi imports for several decades down under and when you see the koi the hobbyists over there are producing, it gives me hope. I’m going to try Allan’s technique with two tanks, probably with showa. On a more pleasant note, I’ve also been looking for new brood fish - as I reorganize my parent fish around my priorities of kohaku and showa. My wife’s visiting family in Japan and took a day out with friends from the UK to travel round some koi farms and keep an eye out for more parent fish for my project. She had quite an eventful day, picking up some koi and learning a lot too. I'll share more on that another time - but in short, it was quite an eye opener and hearing about the trip has given me a few ideas, and reminded me what this whole project is about - producing a few good quality koi. I also have Mike Snaden on the lookout for a high quality male kohaku which I will pair with my matsue one. So lots to look forward to next year – but alas, my project aim will definitely not be realised until 2015 at the earliest.